Johnstown didn't play the best game in the first two periods and found themselves down 3-0. Johnstown played a very good third period, but just didn't have enough to win, as they fell in regulation, 3-2. In the first period, Jeff McFarland scored a goal, on a play that should probably have been blown dead. The puck seemed to be covered by Johnstown goaltender, Colin Brennan, but the referee let play continue, and after a major pile up, the puck somehow found it's way in the back of the net. Assist went to Jake Sloan at 15:20. Springfield would then get a very late goal in the first period. This time it was Brett Skibba on the power play, firing the puck from the low circle, beating Brennan glove side to give Springfield the 2-0 lead. The assists on the play went to Jeff McFarland and Ryan Atkinson at 19:42. There was only one goal scored in the second period, which gave the Jr. Blues the 3-0 lead. On a parcel breakaway, Micah Ranum was able to beat Colin Brennan five hole. After the goal, Johnstown changed goalies with Chris Truehl coming into the game. The third period was all Johnstown. The hot handed Jordan Watt got the Tomahawks on the board beating Ryan Kellenberger glove side. The assists were awarded to Mitch Kontny and Casey Nelson at 1:01. A little over a minute later, Johnstown scored again, this time on a beautiful deflection by Mitch Kontny in between the circles. The assist went to Casey Nelson. Johnstown kept up the pressure and Chris Truehl play perfectly in net, but Johnstown was unable to tie the game up. Springfield out shot Johnstown 38-25. Colin Brennan got the loss making 22 saves on 25 shots. Chris Truehl came into the game and made 13 saves on 13 shots. Ryan Kellenberger picks up the win, making 23 saves on 25 shots. With the loss, Brennan's record is now 7-8-5 with a GAA of 2.78 and a save percentage of .906. With the win, Kellenberger's record improves to 7-10-2 with a GAA of 2.94 and a save percentage of .910. 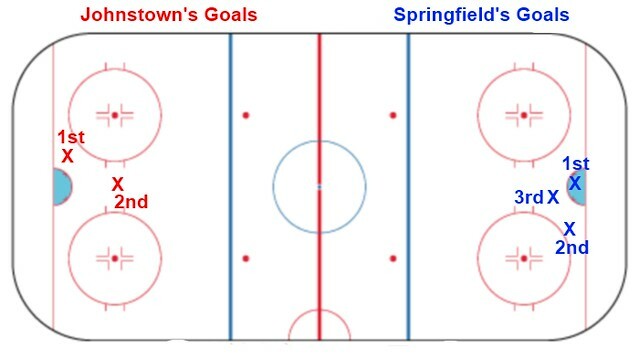 Johnstown went 2 for 6 on the power play and Springfield went 1 for 3. 3. Casey Nelson- Johnstown- He had assists on both Johnstown's goals and was and Even rating. 2. Mitch Kontny- Johnstown- He scored one goal and assisted on another. Both points were on the power play. 1. Micah Ranum- Springfield- His goal was the game winner..
Johnstown were able to bring home at least two points from this road trip, so it's not all bad. Next the Tomahawks faces Jamestown Ironmen at home for their last two home games of the season. Hopefully Johnstown can put together two solid games in front of their fans. The Playoffs are coming very soon and the team isn't going to be able to jump places (up) in the standings, so now they have to pick up some points to keep themselves in fourth place to have home ice advantage in the first "play in" series of the playoffs. Tomorrow we'll post all the final stats from this weekend. During the week we'll have "Staff on the Ice" features, Weekend Preview, and some other fun stuff. If there's something you'd like to know, records, stats, etc let us know and we'll write about it.